The Hispanic Association of Colleges and Universities, and local institutions in the San Antonio area, will welcome a delegation of higher education representatives from Castilla y León, Spain, Jan.22-25, 2019. The delegation is set to visit with representatives of four area colleges to further explore possible collaborative partnerships. 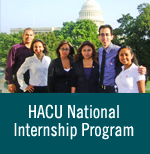 According to Alicia Martínez, assistant vice president for programs, services and international affairs at HACU, the idea for the delegation visit came after HACU President and CEO Antonio R Flores met with government officials from Castilla y León during a visit to Spain in May of 2018. “The Ministry of Education for the Region of Castilla y León expressed great interest in bringing representatives of some of their universities to visit with universities in San Antonio, Texas, to discuss possible collaborations,” said Flores. Flores says the visits will provide opportunities to explore possible collaborations in areas such as bilingual teacher training programs, dual degrees, student and faculty exchanges, and other programs. Martinez will accompany the delegations to the scheduled visits located in San Antonio, San Marcos and Austin, Texas. Photo Caption: HACU welcomes Spain delegation at HACU headquarters in San Antonio, Texas.